To understand how a solar energy works as a domestic first explain traditional electrical installation works. In any of our houses in the city, the electric company gives us access to your mains, after passing through the meter for electricity supply us with very defined characteristics, AC power (AC) 220V and 50Hz. It is for this reason that most electrical appliances market are expected to operate with these features electric power (AC 220V, 50Hz). In order to provide us with electricity by another method we are fortunate to have a technology that existed for years but had not until recent competitively priced to be developed, photovoltaic solar energy. Photovoltaic solar energy uses a physical phenomenon that occurs when sunlight falls on certain materials, is called "photovoltaic effect". This effect produces an electric current through the technology of photovoltaic panels can be exploited with well-defined characteristics. The peculiarity of this phenomenon is that the electric current that is created is going (CC), such as a battery or battery. Since, as we have said, most electrical appliances market running on AC power (AC 220V, 50Hz), we need a system that transforms electrical energy to supply us photovoltaic panels into usable electrical appliances for our electricity. This system is the inverter. Installing off-grid. I.e. facility located in a building that has no connection to the conventional electricity grid. Installation grid-connected. I.e. facility located in a house or building that does have connection to the conventional electricity grid. This installation has the peculiarity that we need to accumulate energy during daylight hours to use it overnight, i.e., production and demand are not equal throughout the day so you have to be able to accumulate when overproduced to have when demand is greater than production (especially at night). So basically panels charge the batteries and we take the battery power for our consumption. To charge the batteries photovoltaic panels are to be connected to them through the so-called solar regulator, charge controller. We will not go far in how a regulator and what types are there (we leave it for another time) works and which one to choose for our installation, but basically the regulator's role is to protect the battery against overload and maximize the load supplied to them. It could directly connect a panel to a battery, but it would be dangerous for the life of the battery and would be a very inefficient system, which we are cheaper to install regulators. To recap, the panels properly connected with regulators and these, in turn, allows us to batteries store electrical energy in batteries for our use. As mentioned, batteries store electrical energy direct current (DC), therefore, if we use it to power conventional electrical appliances need an inverter. At this point it should be noted that when the installation we just lighting would be more appropriate to make an installation of bulbs in current (e.g. 12V), as it may be cheaper to have an investor, an investor besides having a cost, consuming a small part of the energy for the transformation. So, in short, for a system with conventional devices, the panels are connected to the controller, and east to the batteries, and then connect the inverter batteries that can be connected directly to the electrical system of our house (isolated from the network Conventional). I f you have an electric, typical installation of any home, connected to the conventional electricity grid, no need to store energy. Current photovoltaic regulation in Spain allows us to have own facilities that generate electricity for the sole purpose of consuming the least possible energy from the grid, and therefore the minimum payable in power. This new concept allows anyone to consume their own energy without having to worry about the constant increases in the price of electricity. Self consuming with feed-in. We self-consume part of the energy generated; provided that our consumption exceeds production. Otherwise excess generation of our facility goes into the net. We must make a contract with the distribution company, but bear in mind that for small installations not compensate this procedure, because the obligations to bills and keep accounts is not compensated by the low price received by the energy injected into the network ( less than 6 eurocents per kWh discharge). Therefore, it is intended the maximum self-consuming. Self consuming without feed-in. The concept is the same as above, but to avoid having to perform procedures related to the discharge must ensure that the facility never poured electricity. This is accomplished via two routes, by the inverter system that can modulate the production for a pouring 0, and which are certified for it, or with the installation of protection relay ensuring the absence of electrical discharge on the network. With these configurations remove a large cost of grid system; the batteries. Even in assisted facilities (which have batteries), the battery bank is much lower than the need to ensure the availability of energy in any situation without available network. The operation in this case is the following, the panels are connected directly (with the series / parallel suitable configuration) to the inverter input network, and this in turn connects to our domestic electricity grid, with the necessary protections. It's like an appliance, but instead of consuming energy is producing us. Taking electrical bills a year you can see what we have annual consumption, and thus determine which solar system could be implemented in our house. 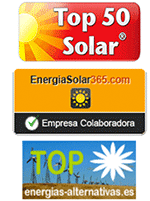 Everyone can save with solar energy, it is only necessary to take the first step.